Adding sound effects at just the right time is a challenge. How do I time a new sound fx? How do I calculate the timing of a new sound effect? In my latest video, Bored, I created the animation for the lamp-switching scene before I got around to adding the sound effect for those actions. I was expecting it to be a challenge … adding those sound effects at exactly the right moments without a lot of trial and error. It turned out that only a bit of simple math was required. 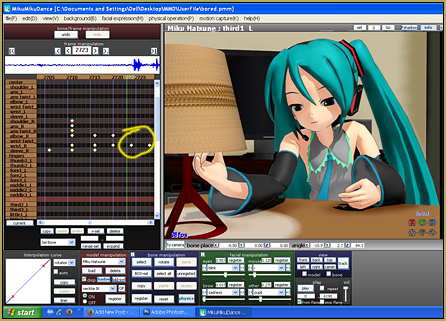 I opened my MMD animation and determined that the motion started at frame 2723. The math: we know that my animation runs at 30-frames per second. 2723 frames divided by 30 equals 90.7666 seconds. 90.7666 seconds divided by 60 seconds/minute equals 1.51277 minutes. to find the number of seconds in .51277 of a minute, we multiply that number by 60 seconds. 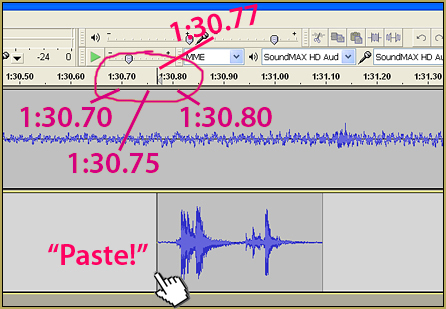 So … at 1 minute, 30.766 seconds, I want to paste my sound effect. I opened my Audacity® software (get the link to the free Audacity audio software from the LearnMMD Downloads page) and imported my existing soundtrack WAV file. I Clicked to “add a new track”. I had previously recorded my “pull-chain” sound effect … so I opened it in a new Audacity window, selected the sound-segment that I wanted to use and clicked COPY to put that sound into memory. … and when you see it … Click to place the cursor upon your moment and then click PASTE (Control-v) to set your sound effect into place. I needed to use the “pull-chain” noise several times …. and so had to “do the math” several times … once for each pull of the switch. To finish the project, SAVE the Project before you go to the next step. Saving, now, will leave the saved file with separate tracks so that you can make changes later, if needed. Now, Control-A (Select All) and then, under the TRACK menu, choose “Mix and Render”, which combines the separate tracks into a single track. Now, under the FILE menu, choose EXPORT and choose the “WAV (Microsoft) 16 bit PCM” format … and you are done. Close Audacity and DO NOT SAVE the final Audacity Project … you want to keep those separate tracks that you have already saved. As usual … all of this took much longer to write about, and read about, than it takes to actually perform the operation. It will be easy once you learn how to do it. If you can add the sounds after the animation, render the animation to a video file then open it with any kind of video editor. You can put the sounds into the video and edit them easily there. can i move the sound?? ?i mean like is there away load the WAV at the fram i want?? 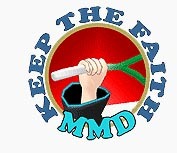 There’s no such possibility in MMD. If you need music start not from the beginning, you have to shift it in Audacity or some other sound editor. I’m having a little trouble. I tried so hard to align my sound effects, but I keep miscalculating it. And I have done the math lots of times, and still the sound doesn’t fit. I either overshoot it or undershoot it. Am I not calculating the frame rate properly? If you overshoot it only by a fraction of a second, then won’t it be easier to adjust the model’s movement instead of recalculating it over and over? Just drag some of the diamonds so your model is in synch with the sound. I guess, I could do that. SH is right that it’s often easier to adjust the animation around your sound, rather than adjust the sound around the animation. When you run into a rock, be like water. There’s one more step if you want to do it better. First, find out when you want the sound effect to occur, like Reggie demonstrated. Then, find out how long it takes from the beginning of your sound until it really bangs, and subtract this from the time. Now, paste the sound effect in at that time.